Go wild with sea turtles! Experience travel with a splash of conservation by participating in STC’s Leatherback Turtle Eco-Volunteer Program in Soropta Beach, Panama. 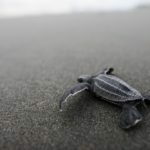 The black sand beach of Soropta draws one of the largest nesting population of leatherback sea turtles in the Atlantic Ocean. Weighing up to 1,000 pounds, leatherback turtles are the largest sea turtles in the world. STC studies have solved many of the mysteries of leatherback turtle reproductive ecology and behavior. Monitoring and tagging at Soropta during the nesting months facilitates monitoring of the nesting population to evaluate the survival status of the species. Eco-Volunteer Participants will work with nesting turtles weighing up to 1,000 pounds and measuring 5 to 6 feet in length. Walk the beach in the morning to check the status of marked nests and count leatherback tracks and nests from the previous night. Images of the Leatherback Turtle Program. Eco-Volunteers must be 16 years or older. This experience is ideal for educators, couples, spring breakers, groups, or anyone who is interested in helping sea turtles and making a difference. Discounts are available for groups of six or more. If under 18, must be traveling with an adult. A passport valid through the date of return is required. Non-U.S. citizens should contact the Panama Embassy for visa requirements. Upon registering, you will be sent a Field Station Manual providing packing tips, travel information, STC policies and site information. We need you to accurately evaluate your ability to meet the conditions detailed below in order to safeguard your health and safety, and ensure that you can participate fully and effectively. If you feel you do not meet these considerations, please reconsider taking part in this program. The minimum age for participants is 18 years old without a parent or legal guardian and 16 years old with a parent or legal guardian. Nesting season for leatherback turtles runs from March through June each year. Eco-Volunteer Adventures run from March through July. 1 week session only. The costs of running a field station to enable scientists to conduct research are substantial. Some costs are covered by grants, and funds secured by the STC, and some by the fees paid by research eco-volunteer participants. Prices start at $1,397 per person, double occupancy in Panama City, all inclusive. This price does not include international airfare. All prices are in US$ and are per person. Double Occupancy is for the hotel in Panama City and/or Bocas del Toro. Meals while not at the STC station. Eco-volunteers will stay at STC’s Soropta Biological Field Station, located in a tropical rainforest setting, and just steps from the black sand beach. There is only one type of accommodation available at Soropta Beach, very rustic. Housing is dorm-style living, includes bunk beds with up to 6 people per room and a community bathroom. You will need to bring your own mosquito net for sleeping. Images of STC’s Soropta Beach Research Station. Days are yours to relax, explore the area, and talk with biologists. Experience very rustic, but comfortable, shared housing. Nightly hands on field research with nesting leatherback turtles.